A group of fourteen members of the Norwich Citadel Band (Bandmaster Richard Woodrow) participated in the Edith Cavell Memorial Service in Norwich on Saturday, 13 October 2012. Other participants included members of the Red Cross, Royal British Legion and other ex-servicemen’s organizations. The Lord Mayor of Norwich and the Belgian Ambassador were also present. Edith Cavell (4 December 1865 – 12 October 1915) was a British nurse working in Belgium during World War I. She was celebrated for saving the lives of soldiers from all sides. She also helped some 200 Allied soldiers escape the German occupation of Belgium, for which she was arrested by the German authorities, court-martialled, found guilty of treason and executed by firing squad. 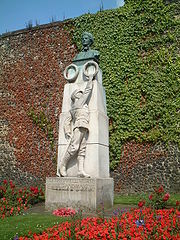 The execution received world-wide condemnation and extensive press coverage, although, under international law at the time, including the First Geneva Convention (article 6, 1906 version), her assistance to British and French soldiers escaping from occupied Belgium, which was viewed as treasonous under German law, was not protected. Following her death, her remains were eventually interred at Norwich Cathedral. Cavell was born in Swardeston, near Norwich, where her father was the local vicar. Following her death, her remains were eventually interred at Norwich Cathedral. The service at the memorial is an annual event held on or about 12 October. This year, a short march and wreath-laying at the memorial followed the service led by the vicar of Swardeston. This article was posted in News and tagged Edith Cavell, memorial, Norwich Citadel Band, Richard Woodrow on 8 December 2012 .